British Race Cars - New! 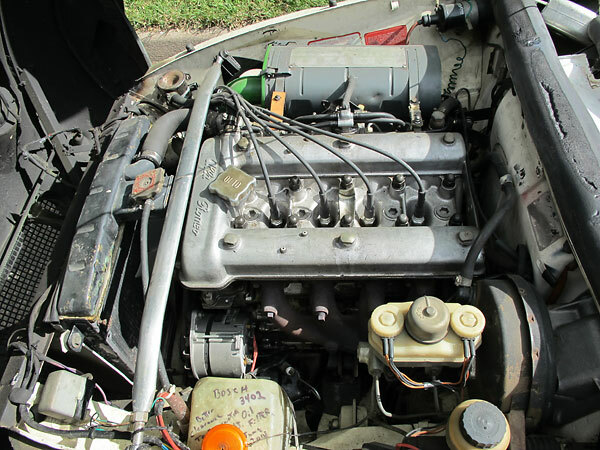 Engine: stock 1974 Alfa Romeo 1962cc, dual overhead camshaft, inline-four. 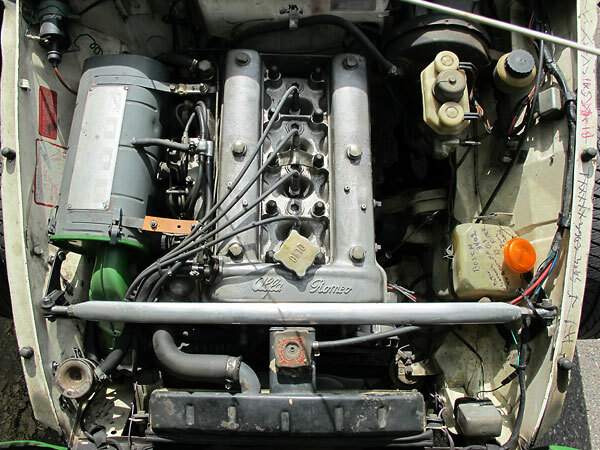 Stock SPICA (Societˆ Pompe Iniezione Cassani & Affini) mechanical fuel injection system. 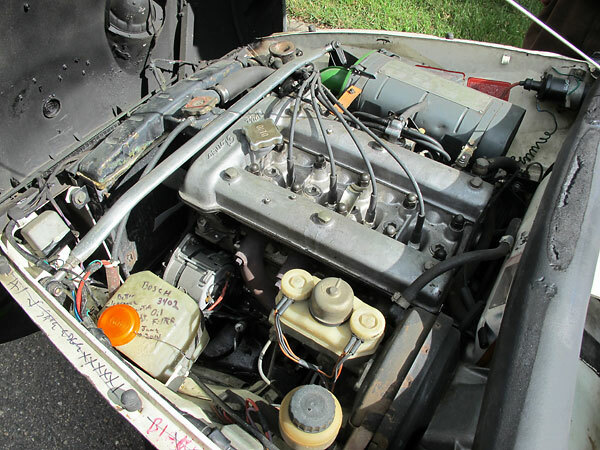 Cooling: stock 1974 Alfa Romeo Spider copper and brass radiator. Engine driven six-blade plastic fan, without shroud. Finned aluminum oil pan. 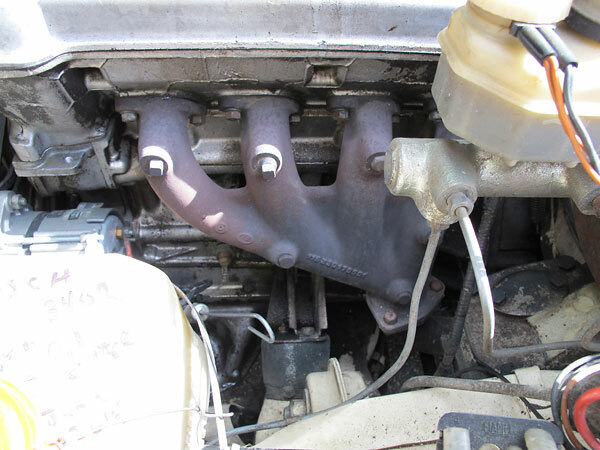 Exhaust: stock 1974 Alfa Romeo Spider cast iron exhaust manifold. 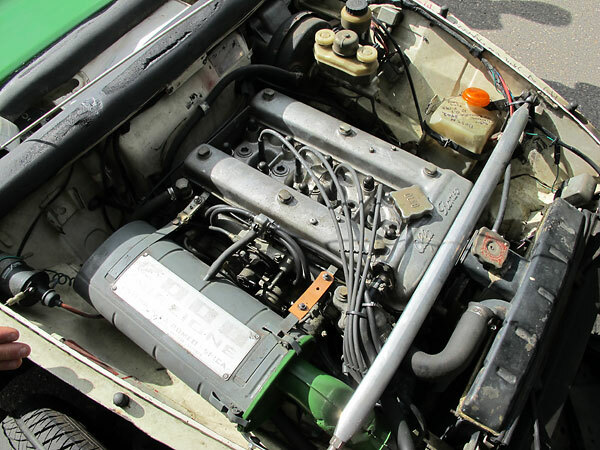 Transmission: stock 1974 Alfa Romeo Spider 5-speed manual. Rear End: stock 1974 Alfa Romeo Spider differential and 4.56:1 gears. Front Susp. 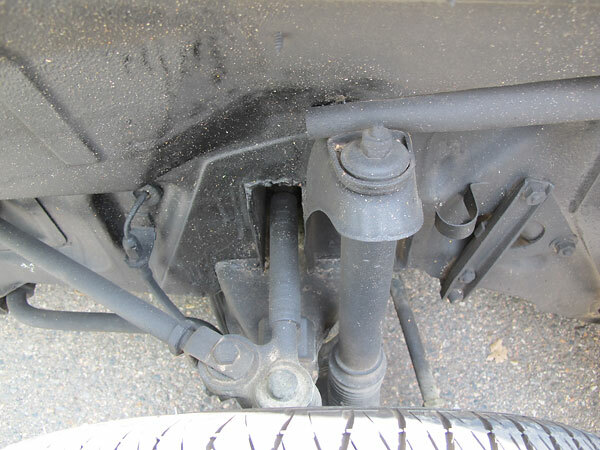 : stock 1974 Alfa Romeo Spider wishbones, coil springs, and telescopic dampers. Rear Susp. 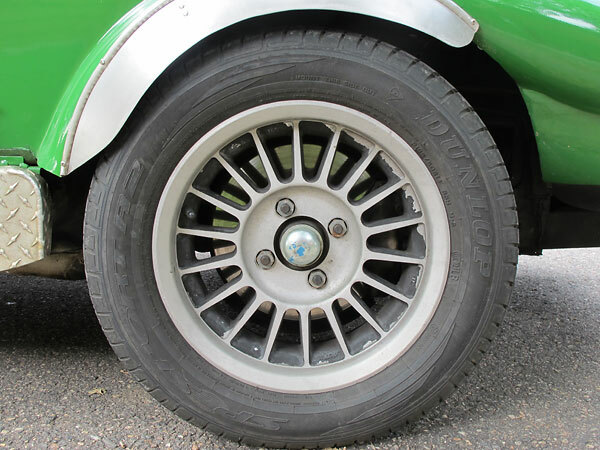 : stock 1974 Alfa Romeo Spider live axle, radius arms, coil springs, and telescopic dampers. 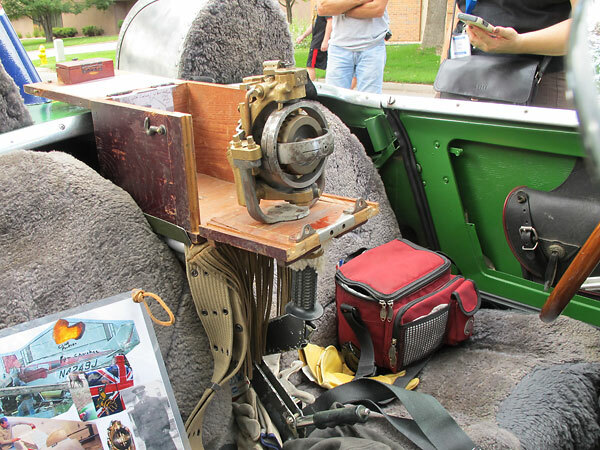 Brakes: stock 1974 Alfa Romeo Spider tandem master cylinder, power brake booster, and 4-wheel disc brakes. 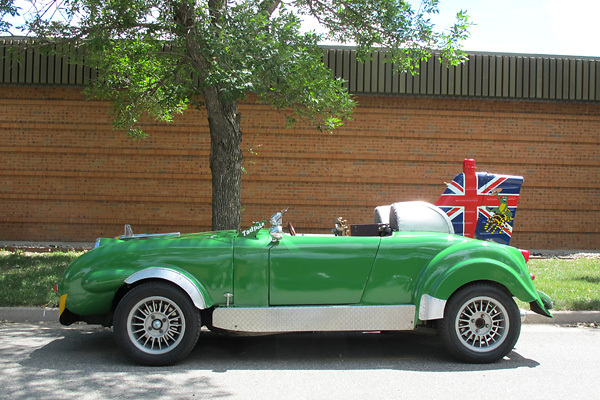 Wheels/Tires: Made in Britain, 14x6, 12mm offset, aluminum wheels. Dunlop SP Sport A2 tires, size P195/60R14. 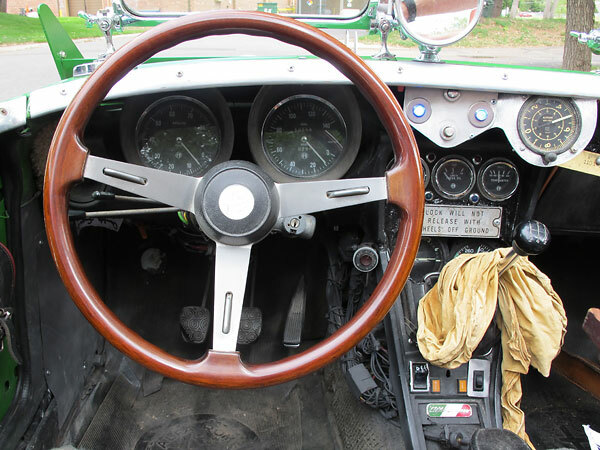 Interior: stock Alfa Romeo Spider "Personal" steering wheel. 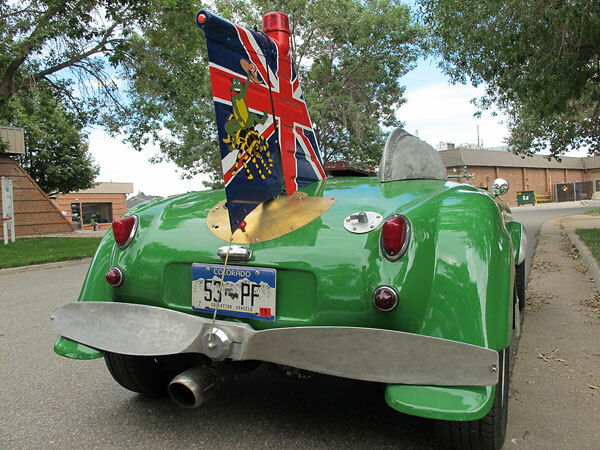 Body: 1959 Austin Healey Sprite body. Custom air dam. 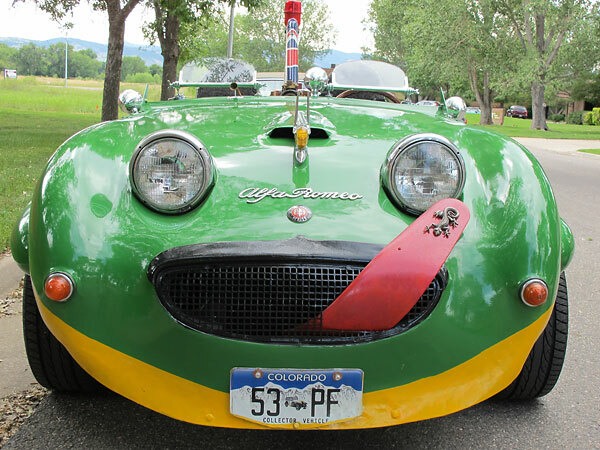 Custom tongue-shaped front nerf bar. 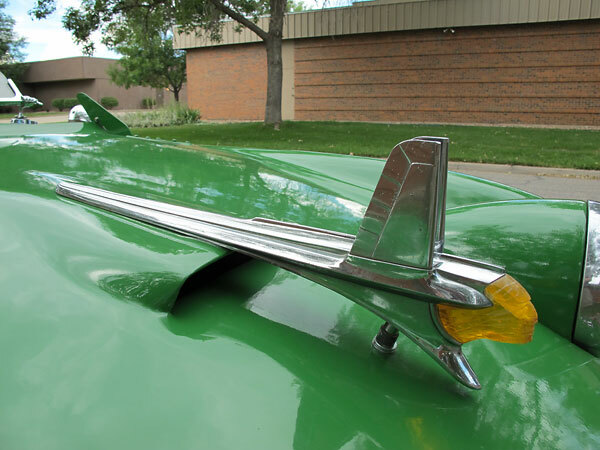 1953 Pontiac Chieftain hood ornament. Custom hood scoop. 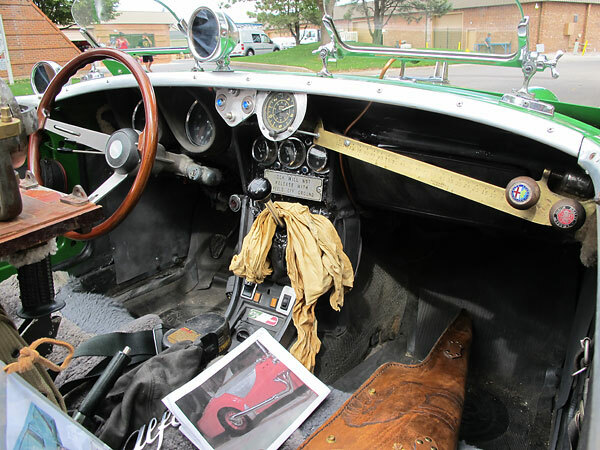 Dual Brooklands-style windscreens. 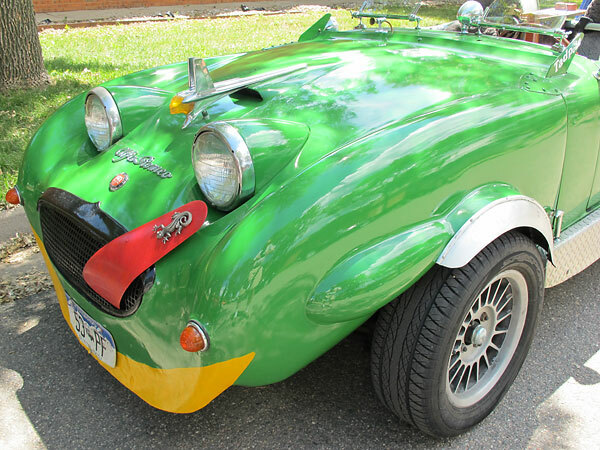 Custom front and rear fender flares. 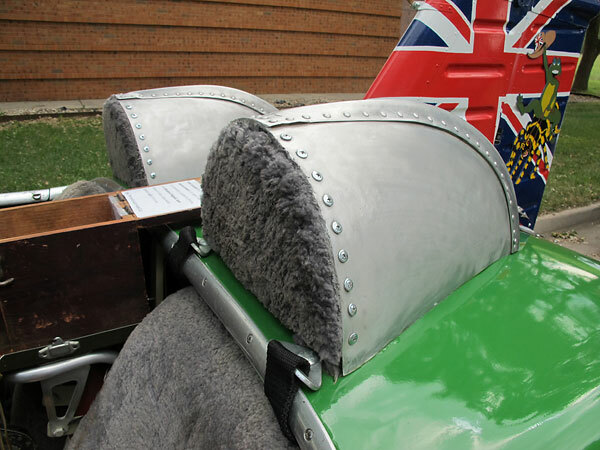 Custom headrest cowls. 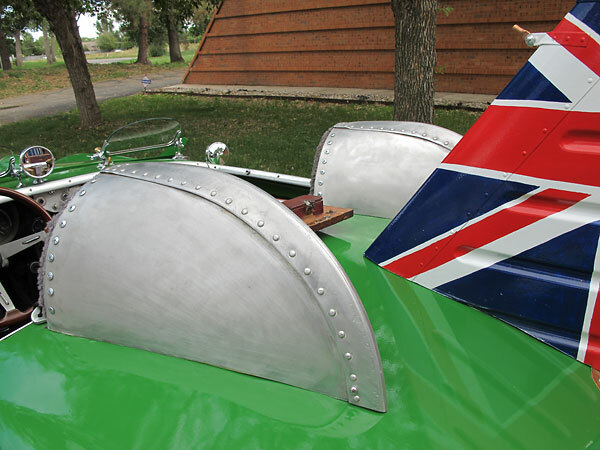 Custom tail fin with functional rudder. 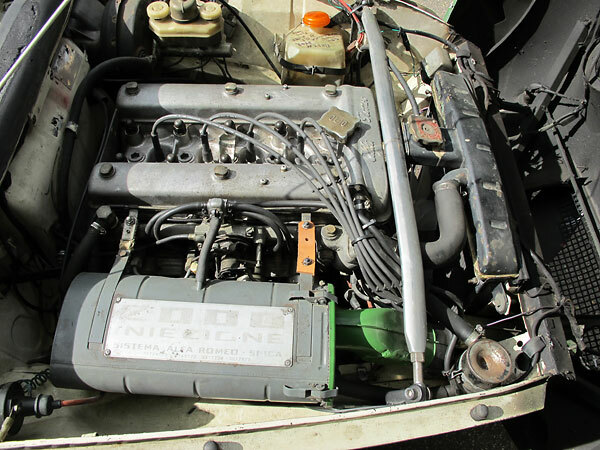 Electrical: stock 1974 Alfa Romeo Spider alternator. Completed: 2013. 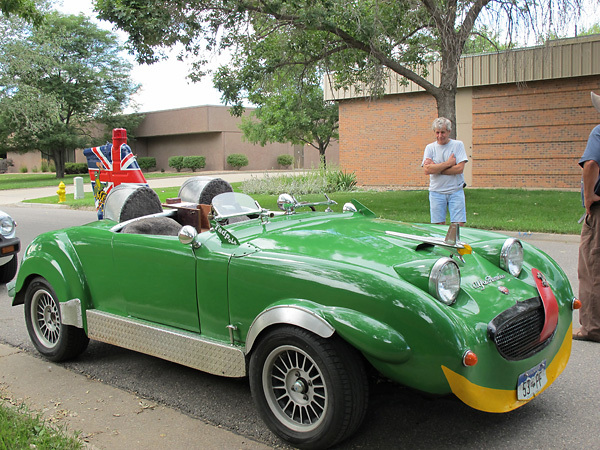 Driven about 500 miles as of BritishV8 2014.
chambers and centered spark plugs, and dual overhead camshafts driven by double-row timing chains. feature a large, finned, 7-quart capacity oil pan. They have a reputation for running cool. towers, if only there were strut towers. 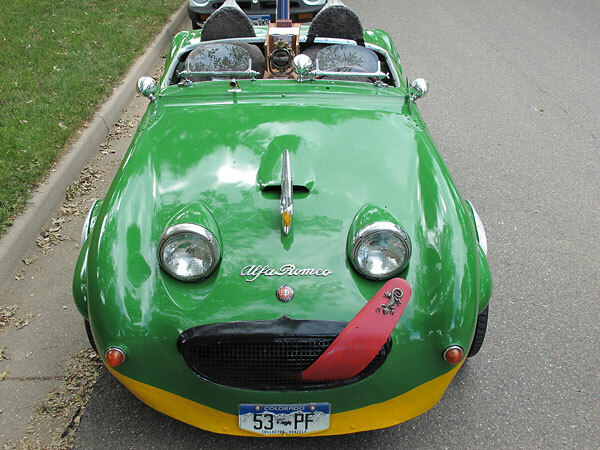 It was adapted from some other car. Stock 1974 Alfa Romeo cast iron exhaust manifold. SPICA (Societˆ Pompe Iniezione Cassani & Affini) mechanical fuel injection. 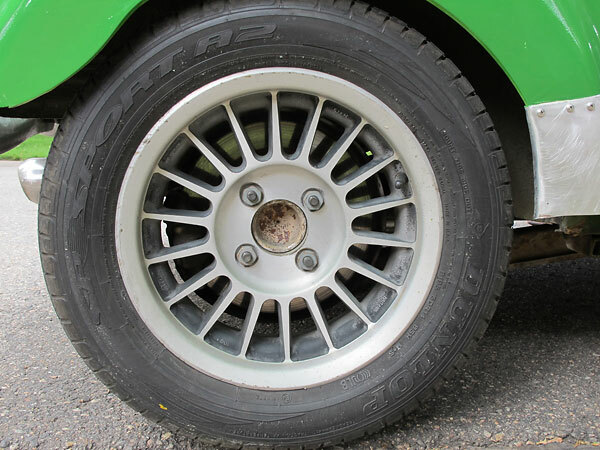 Decal: "2000 Iniezione Sistema Alfa Romeo - Spica, Patented 3146770 - 3312208 - 3577978"
A clothesline reel is used to limit travel of the front clip. Stock 1974 Alfa Romeo Spider wishbones, coil springs, and telescopic dampers. Enjoying this article? Our magazine is funded through the generous support of readers like you! To contribute to our operating budget, please click here and follow the instructions. 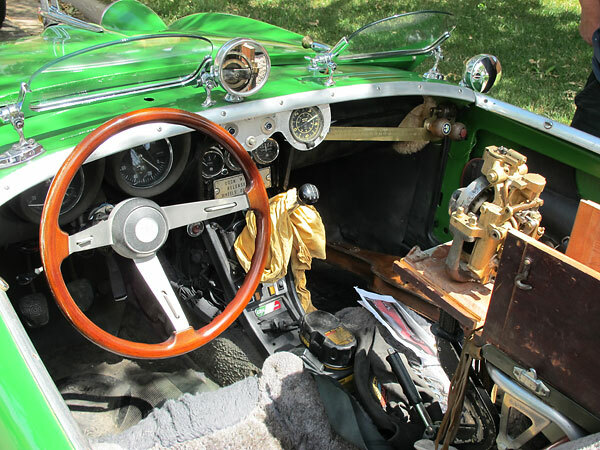 Alfa Romeo "Personal" steering wheel. Plate in center says: "Lock Will Not Release With Wheels Off Ground". At right, a graduated brass lever from a Fairbanks Scale. 18-pound brass gyroscope off a Japanese WWII-era 3000 pound torpedo. Manufactured by Mitsubishi in Nagasaki Japan, it's still in its original wooden shipping box. 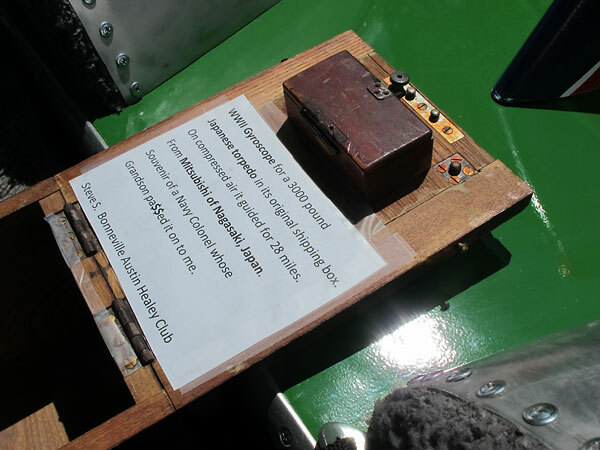 A U.S. Navy Colonel brought it home as a souvenir. 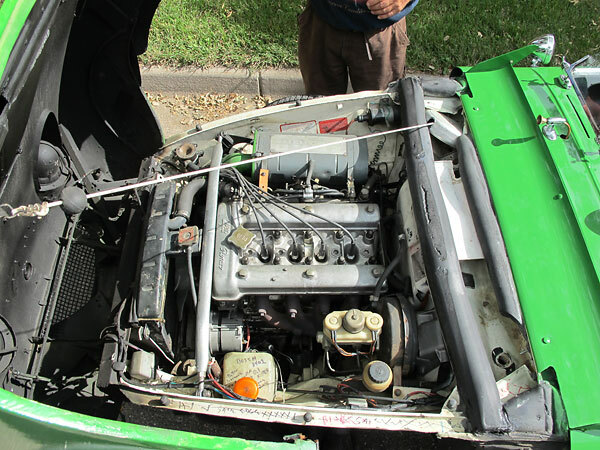 than the original 1974 Alfa Romeo Spider did before the body transplant. add to the weight of a sports car." ring and pinion set from a rare automatic-transmission Spider to install when time permits. 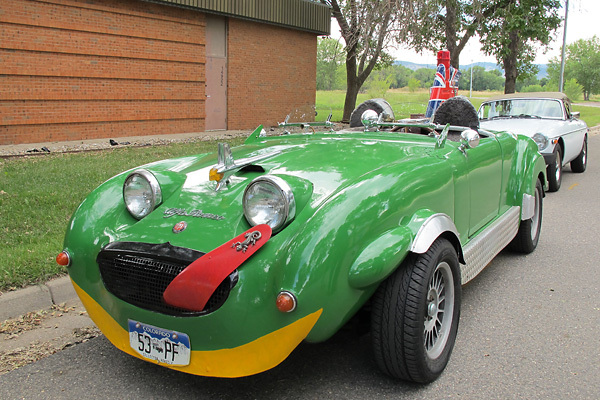 "Yes, I mated an Italian Spider with a British frog. Foreplay took 4 years." nerf bar and "it's stronger than the plastic bumper on any new car." 1953 Pontiac Chieftain hood ornament. Steve made headrest fairings out of the tips of an aluminum canoe. Steve purchased the canoe for the price of the scrap aluminum. Joseph Pollak Co. of Boston Massachusetts manufactured this battery disconnect switch. 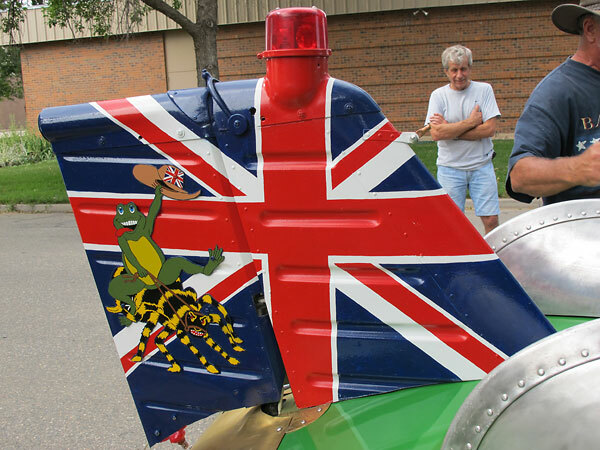 The tailfin is off a Piper Cherokee from North Dakota that died when a tornado destroyed its hanger. 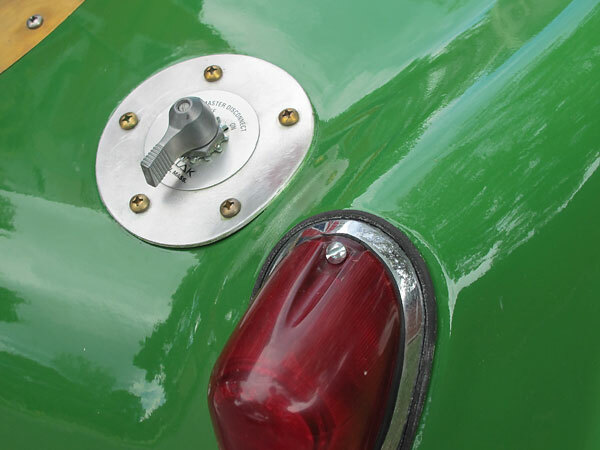 It swings left and right with the turn signal indicators, via Mercury outboard motor choke solenoids. and I will stick to it." Made in Britain, 14x6, 12mm offset, aluminum wheels. Dunlop SP Sport A2 tires, size P195/60R14.